Important: Picking the right Avocado. California Avocados are the ones that are rough skinned and dimpled (not smooth skinned). They should be ripe and soft like a yellow banana. Take out the small stem. Cut the Avocado in half the long way. Separate into two. Remove the pit. Take a tablespoon and put in between the skin and the pulp of the Avocado and remove the pulp. 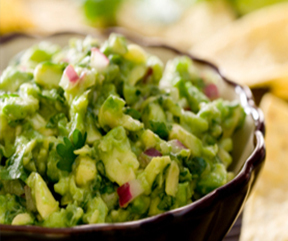 In a good size bowl, dice up the pulp of two Avocados into ¼ inch pieces. Mash the third Avocado like a potato. Combine all the ingredients and mix well with a spatula. Store in refrigerator. If possible, get unsalted corn chips and dip away!